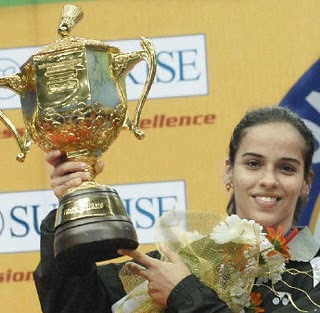 Indian badminton champion Saina Nehwal faltered at the final hurdle, failing to complete the hat-trick of championship titles at the Indonesia Open Super Series after losing to World No. 3 Yihan Wang (Chinese) in the final in Jakarta on June 26. Saina frittered away a match point en route to a 21-12, 21-23, 14-21 loss to her equally error-prone rival. In men's final, World No.1 player Lee Chong Wei of Malaysia thrashed Danish Veteran Peter Gade 21-11, 21-7 to win the Indonesian Open for a third time.